This is more like it! I was able to get one of the NB 2 trips that serves Melville Towers – an occurrence that happens only once every two hours. Of course, this is only one of a few random extra deviations that happen on this route, and the rest happen even less often! The bus at its namesake, Lund’s Corner. The route begins at Lund’s Corner, a “downtown” that has too many parking lots to be very interesting. 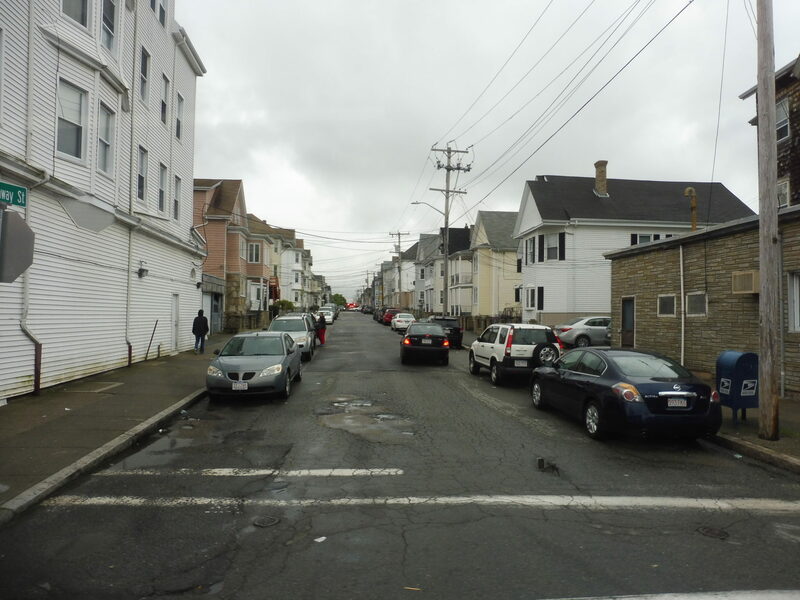 We used local streets to loop around to head south on Acushnet Ave, where the businesses quickly thinned out and became dense houses and apartments. Going by Brooklawn Park was a highlight. 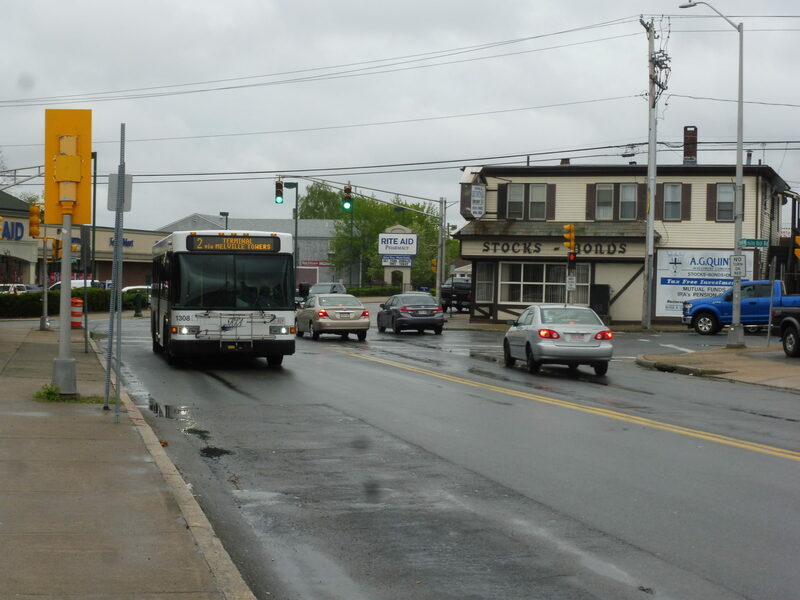 South of the park, Acushnet Ave became a major retail drag. Lots of stores and restaurants were lined up on either side of the road, and for the most part, it was pretty urban and walkable! The side streets, meanwhile, were packed with apartments. One of the side streets. We eventually turned onto Sawyer Street. 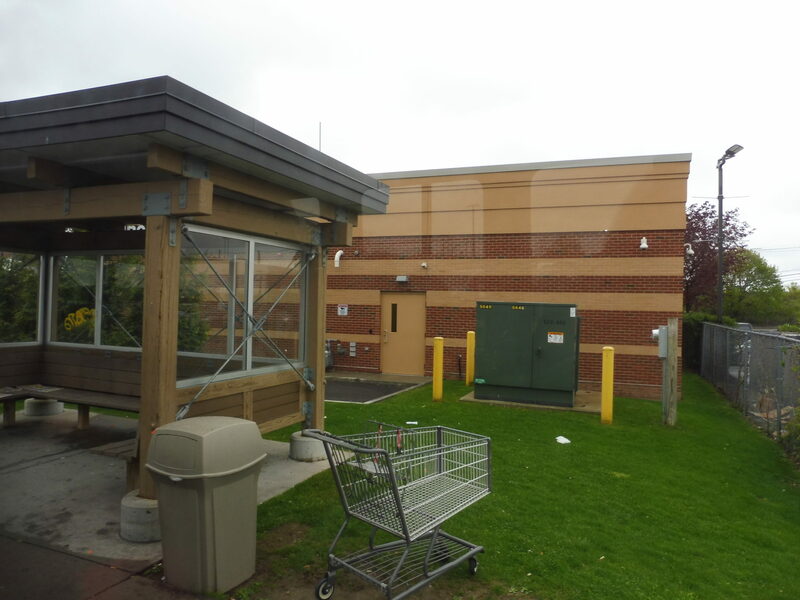 This was an elaborate deviation to serve a Market Basket, and although the supermarket did get a nice bus shelter, it was still an annoying deviation. Case in point: after serving it, we had to continue out to the Acushnet River only to loop around onto Coggeshall Street to return inland. That’s the only way the street pattern will let you go to Market Basket. We eventually turned onto North Front Street, which went under I-195 and got industrial. Bad picture, but it’s seriously a nice shelter! Using Logan Street to get to Acushnet Ave again, we had a highway on one side and a factory converted to apartments (and then random industrial buildings) on the other. 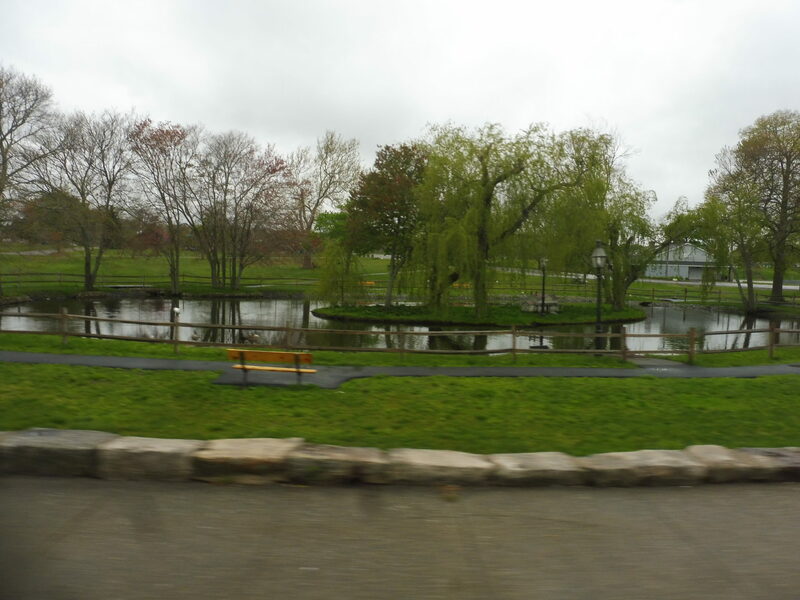 After passing the Whale’s Tooth parking lot, we turned onto Hillman Street, crossing over the JFK Memorial Highway. And now…it was time for the Melville Towers deviation! What adventure would this rare event bring us? Oh…a one-block jog just to get a little closer to the apartment building. Okay…cool. And after that, it was a straight shot down Pleasant Street to the New Bedford Terminal. Ridership: This is the third-busiest route on the entire system! It got a little over 800 people per day in May 2014. Pros: The ridership is reflected in the weekday schedule: service is every 20 minutes all day from 5 AM to 9 PM! Acushnet Ave is a dense, major corridor that definitely deserves this level of service. Cons: You know…there’s a lot not to like about the 2! For one thing, Saturday service is every 40 minutes, when it really should be at least every 30. I mean, when it’s running every 20 minutes at 8 PM, I doubt it’s getting all that much ridership – maybe service could be less frequent at night to balance out better service on Saturdays? Also, this route should be a prime candidate for Sunday service. Finally, this thing has way too many variants. The Melville Towers deviation happens about every two hours and saves people a one-minute walk; the Whaler’s Cove deviation serves an assisted living facility, but it’s a long deviation, only happens twice a day on weekdays only, and everyone who would use it is eligible for SRTA demand response anyway; and the random “express” route that the first round trip of the day takes adds a lot of complexity for just one trip. The one deviation that makes sense serves an industrial area twice outbound and once inbound, timing with work hours, so that’s useful – so long as people actually use it, of course. And I forgot to mention that they don’t change the running times for the route when they do deviations, so I would imagine some trips get late! Nearby and Noteworthy: Lots of businesses along Acushnet Ave, including some interesting hole-in-the-wall bars and restaurants. I’m also fascinated by the New Bedford Museum of Glass, which seems like a hidden gem. 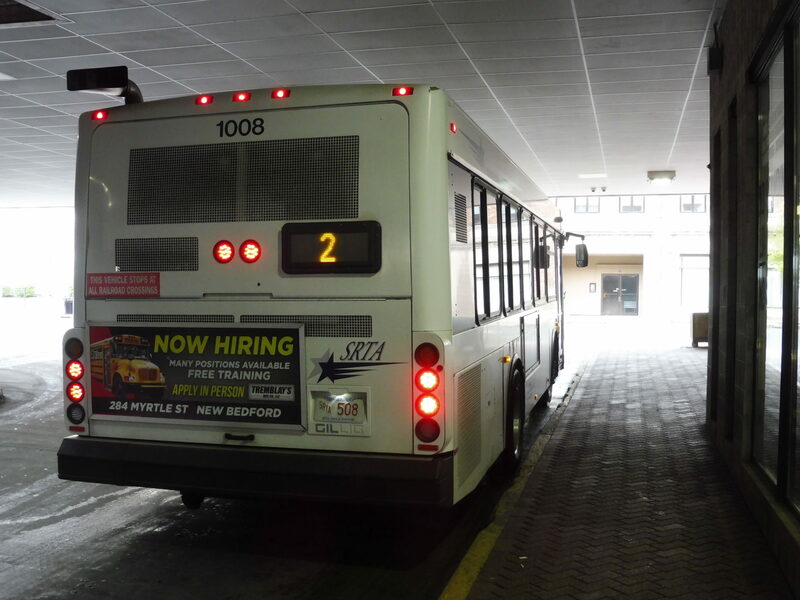 The 2 is an important route. But what should be a reasonably direct run down Acushnet Ave becomes a crazy schedule where you have to check to see which of the six mostly unnecessary variants your trip will be doing (main route, express route, industrial park, Melville Towers, Whaler’s Cove, and both Melville Towers and Whaler’s Cove, which happens on one weekday inbound trip). Plus, the Saturday service is less frequent than it should be, and the SRTA really really really needs Sunday service. But other than all those things…the route’s fine? Two posts in one day? Awesome!